Most direct mailers segment their promotions to customers, sending offers their analytics have determined will be most responsive to this particular product or offer. They do this because it is a profitable approach. Dynamically segmented direct mail boosts conversions and profits. When email first came along, database marketers thought this new medium was ideal for building customer relationships. Instead of sending a letter once a month for $600 per thousand letters, we could afford to send e-mails every week or even every day for $6 per thousand e-mails. What a saving! What a wonderful way to maintain contact and boost sales! Numerous studies have shown that segmentation of emails improves open and click rates. The Marketing Sherpa Email Marketing Benchmark Guide 2008 reported that for the mailers studied, open rates for segmented versus non-segmented campaigns are as much as 20% higher on average for the first 30 days. This rate drops to 14% higher in days 60 to 90. But many marketers don’t use segmentation in their email marketing programs. Why not? Actually, after we looked into the situation, we found that those not using segments in e-mail marketing are doing it for quite rational and economic reasons. It comes down to a question of frequency versus segmentation. Creating dynamically segmented e-mails (where the copy varies based on the segment of the subscriber) is expensive. To do it properly, you have to have a database that contains the necessary data, and hire the staff to dream up and write copy for each of your segments. In the direct mail days, we typically sent one or maybe two letters a month to each customer. If you had four segments, for example, there was plenty of time for your staff to dream up and write copy for each of their segments. They had two weeks or more to do it. With e-mail, we soon learned that frequent e-mails are very profitable to send. Go from once a month to once a week and profits go up. From once a week to twice a week, profits still rise. From twice a week to once a day, still more profits. Of course, by doing this you may be losing your most valuable customers who unsubscribe because they are sick of so many communications, but management seldom looks beyond this quarter’s sales. “Send more” is the watchword, so almost every e-mail marketer has been doing just that. Of course, it is almost impossible to write dynamic copy for different segments if you are getting out e-mails on a weekly or daily basis. Creative segment managers are hard to find. They are expensive. Even more expensive is the appending of demographic data and building a database (rather than a mailing list) that is needed to support dynamic segmentation. Many e-mail marketers are worried that a 14% rise in open rates (which may mean a 0.2% rise in conversions) may not cover the cost of hiring many creative writers and building the necessary database. Good e-mails are much more expensive to create than good direct mail pieces. A direct mail piece is what it is: a piece of copy with products, prices and color. A dynamic e-mail, on the other hand, is much more complicated because it is filled with links. You may be showing only a few products, but each product, if done right, contains many links. Each product should have ratings and reviews, each of which can be reached by a link. Links also lead to colors and sizes, and comparative research. Each of these links has to work, and it has to lead to hundreds of other links. To get this right will take an experienced e-mail creative person at least full day. Additional creative staff is also expensive. A typical e-mail development staff might consist of three people at about $150,000 per year. One of those people is the creative one. If you want to send two e-mails per week, and have eight different segments, you will have to create 16 different e-mails per week. It takes about a day, on average, to create a dynamically segmented e-mail complete with links. That is 16 creative man days per week. So, to your regular staff of one creative, you will have to add two more creative people at a cost of $100,000 per year. They will have to be backed up by a professional database that holds all the segments, and the products that they are likely to be interested in. To do the segmentation, you have to append data to all your e-mail records. This is not cheap. The database for a large marketer costs a minimum of $1,000,000 per year. So let us assume that the additional cost of dynamic segmentation is $1,890,000 in the first year. 1. The type of analysis needed to properly segment can be above the heads of most e-mail marketing staffs. They have never calculated the lifetime value of their subscribers. They probably do not know, at any given time, their costs, their conversion rate, or most of these numbers. 2. E-mail marketing staffs are not paid to do this type of analysis. They are paid to get out the e-mails so as to make next quarter’s revenue goal. 3. E-mail staffs are operating on a fixed budget. Their goal is to keep the costs per e-mail down, not to increase them as this example shows. If they wanted to create a database, where would they get the budget? Who would run it? Arthur Middleton Hughes, vice president of The Database Marketing Institute, has presented 28 seminars on database and email marketing. 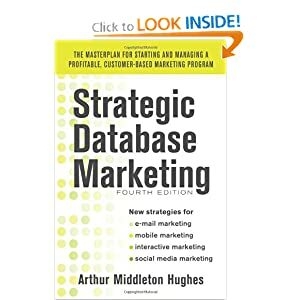 Arthur has also authored several books includingStrategic Database Marketing 4th Edition (McGraw-Hill 2012). He and Andrew Kordek, chief strategist and co-founder of Trendline Interactive, are hosting a two-day Email Strategy Study Group in Fort Lauderdale March 26-27, 2013, featuring group competition for email marketers responsible for subscriber acquisition, lifetime value, ratings and reviews, boosting their email budget, and doubling their ROI. To learn how to attend the Study Group,click here.